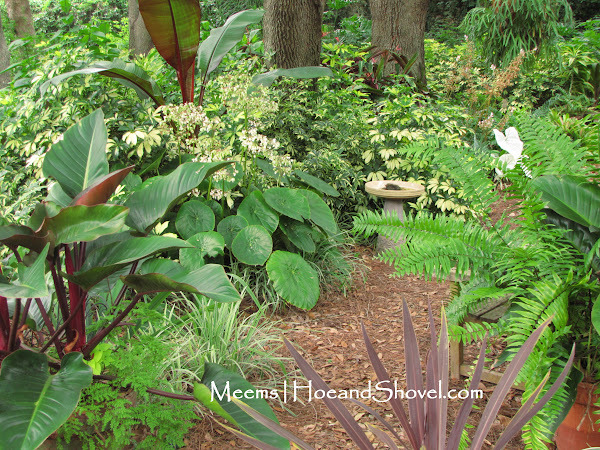 Large leafy plants unquestionably feel exotic and shout "tropical-ness" in a lush, islandy sort of way. Every garden should have them... somewhere even if it means placing them in a container. Happenstance would be the best way to describe the way I acquired my first two banana trees. It was one of those typical extremely hot and steamy August days in Florida. I was shopping at my favorite garden center. The Ensete 'Maurelii' red banana trees were packed in tightly with an odd assortment of sale plants that had seen better days. I bought them each for $5. A great deal considering how well they've performed. 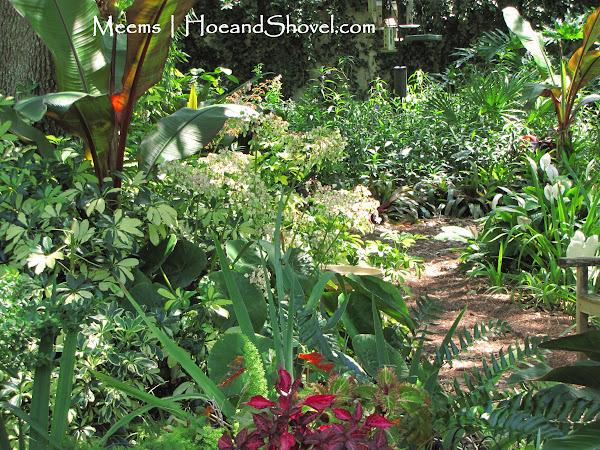 The area of the garden now fondly referred to as the tropical pathway was in its earliest stages of creation. 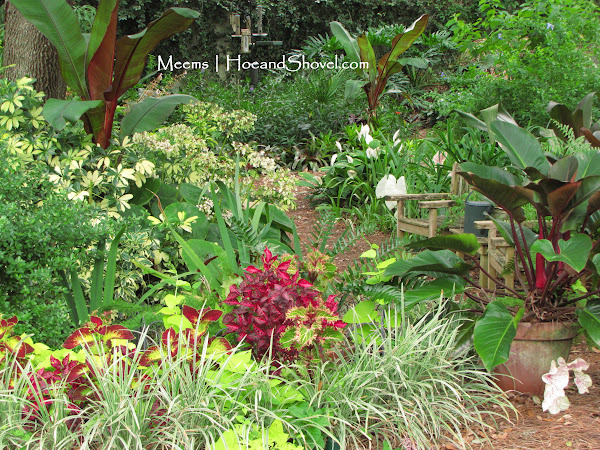 You can read my 2009 how-to create a tropical pathway blog post here for an indepth look. Ensetes are strictly ornamental and don't produce any real fruit. [Thus, the corny title to this post.] It is their deep red coloration that attracted me to them in the first place. Both Ensete bananas are happily living at the edges of the oak tree canopy where they receive a goodly portion of filtered sunlight for most of the day. Other than having to stake them with rebar to keep them upright they receive no special attention. In winter they usually slow their growth but this year they hardly noticed it was winter. That's because winter hardly acted like winter. Sticking with the ornamental variety of bananas I've added several 'Siam Ruby' banana trees since 2009. This one reaches only a height of about 8'. 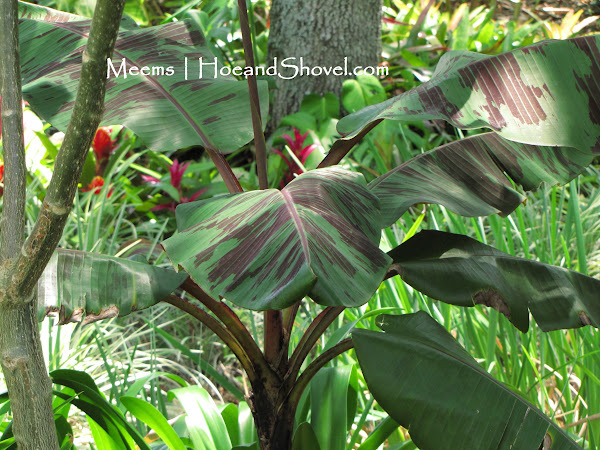 Again, it is the blotchy red on the large green leaves that helps this one blend in with the rest of the garden. Update edit: A kind reader reminded me the banana pictured above is actually a Musa Zebrina banana. Also an ornamental without fruit. I have added 'Siam Ruby' starts to the back garden which is a brighter red with bits of lime green foliage. 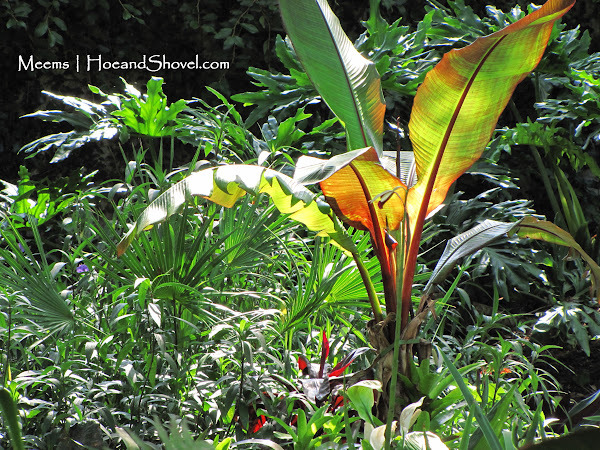 Which banana trees are you growing? Wow, these bananas are gorgeous. I especially love that last one. I don't have a banana tree but Ihave been tempted to get one. There is one variety that can survive our winters. I have seen it in other gardens around here.It has some red in the leaves. They make quite a statement. Yours look great. Meems, After being inspired by your beautiful ornamentals, I too am growing Ensete ventricosum 'Maurelli'. I have three of them. One is large, like yours, and two are small ones from eBay. I planted the babies in the ground in March. If well-fed and watered, they are supposed to be able to reach ten-foot in a single year, so they will hopefully catch up quickly. They do seem to be growing fast, so I guess I'll find out! I am in love with them. Good luck with your Siam Ruby. If you ever have any questions, www.bananas.org has a wealth of information and lots of good people. No bananas here, although they are eaten daily by two members of our family. I think we don't have enough shade though. Yours definitely add to your tropical look. we live in a banana growing area and so are not allowed to grow bananas and I think that extends to the ornamental type. I do love yours though, and might have to look into them a little more thoroughly. I have some bananas, but scaled them down because by October they always looked pretty ragged. Yours are beautiful! 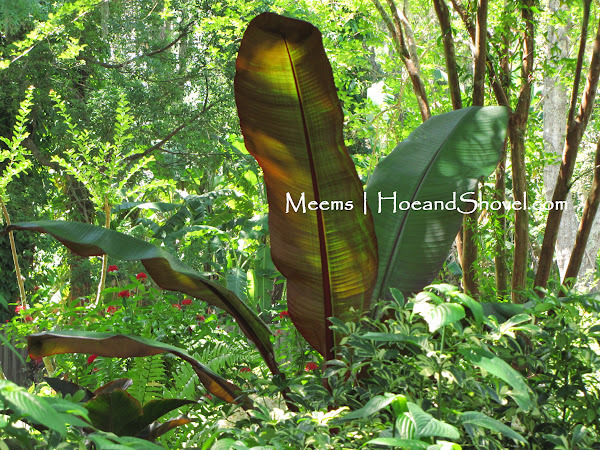 I like the reddish colored banana trees...I must make a note to add some of them in the future. I've got a couple that I inherited...they were growing on the property when we built. I left them because of their tropical look...no bananas though because the past bad winters. Perhaps this year we'll get some. I just discovered your site a couple of days ago. Lovely! I'm actually in south Texas----the same latitude as Miami. Depending on who I ask, we're either zone 9B, 10, or 11. We have heavy clay soil and the soil and water are both alkaline, but it's great to find so much info that I can use in one place. Sigh----I wish we'd get rain---lucky you. Meems, how do you work around the roots of all those huge trees? My yard has so many roots from trees that it makes it virtually impossible to plant anything around them. I am so afraid I will kill the tree if I mess with the roots. Help! As you probably know I have lots of large mature trees with extensive root systems. The key for has been to start small. Every plant that goes in around a tree has a small root system like a rooted cutting, division,or bare root. Lots of patience involved waiting for the setting to mature.